Right: Saint Nicholas, Bishop of Myra (part of modern-day Turkey). 'Tis the season: the in-store holly and ivy went up the week after Hallowe'en, the Salvation Army has installed its members in the city's malls, and the usual seasonal suspects are back on the air. A society grown secular and multicultural often eschews what Christians consider the true meaning of Christmas: Santa Claus has replaced Christ as the central figure. Of course, one could reasonably argue that Claus-- if one considers his whole story-- best embodies the season's past, present, and future. Despite his current, saintly name, the character's origins pre-date the Christian faith, probably by centuries. The inhabitants of pre-Christian Europe paid careful attention, and religious devotion, to the seasons. Many cultures performed midwinter festivals celebrating the eventual arrival of spring. In fact, people may have believed that the attendant rituals ensured spring's coming. Ancient Rome had two such festivals: Saturnalia, honouring the god of the harvest, and Natalis Solis Invicti, celebrating the birth of the sun. This second date reflects the growth of the cult of Mithras, a now-forgotten god with a familiar birthdate: December 25. Midwinter celebrations carried on into the Christian era, much to the chagrin of the Church, which distrusted anything of pagan origin. By the fourth century, many clergymen had decided that, if they could not eliminate the festival, they should incorporate it into their faith. No offical feast date of Jesus's birth as yet existed; the Bible identifies neither the day nor the season. The connections between pagan festivals of earthly renewal, and a Christian figure of spiritual rebirth, however, seem obvious enough. Pope Liberius made the official declaration of December 25th in 353 A.D.. Many old customs would, over time, find their way into the new celebration. About the same time that a pope was planning Jesus's birthday, a bishop was involving himself with the problems faced by children. Stories spread about how this clergyman of Myra, Nicholas by name, helped young people, and gave presents to the needy. After his death, the Catholic Church proclaimed him patron saint of children. To this day, it is a white-bearded St. Nicholas or Sinterklaas, with bishop's robe and mitre, who brings gifts to many European households. In others, the pagan fertility figure and the Christian bishop gradually combined to become Father Christmas, or Santa Claus. Other influential figues include, a name most likely derived from Christ Kindl (Christ-child) and Belsnickle, derived from Pelz-nickle (Nicholas in Furs). In the nineteenth century, Christmas grew in cultural importance; correspondingly, Claus increased in popularity. He was still, frequently, a giant in those days, though a white-bearded one. Most of the time, he wore red, green (remnants of the midwinter celebrations) or white (a nod to Nick? ), but artists also depicted him in yellow, blue, and other festive colours. Stories were told which housed him in the far north-- where winter never ends-- and horses or reindeer were said to be his method of transportation.2 The elves, meanwhile, appear to be borrowed from Norway and Denmark, where julnissen were said to hide presents on Christmas Eve, to be found the next morning. He sees you when you're sleeping... 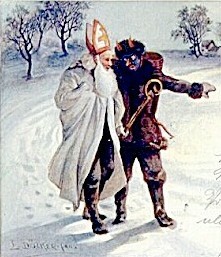 This nineteenth-century Santa wears the white of the Christian saint, but he comes off looking a little creepy. Scrooge confronts the Ghost of Christmas Present, whose Pagan roots are clear. Washington Irving's 1809 book, Knickerbocker's History of New York, made Santa a pipe-smoking old elf, and Clement Clarke Moore's poem "A Visit from St. Nicholas," written in 1848, gave "eight tiny reindeer" their popular names. In some countries, St. Nicolas had unusual travelling companions. 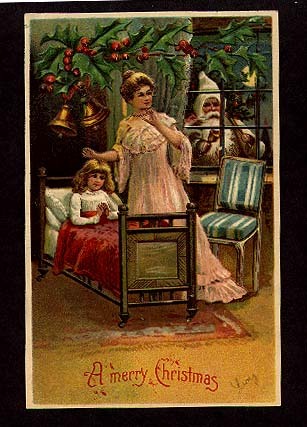 The 1899 card, above, show Nick with a "krampus"-- a sort of conquered and tamed demon.. 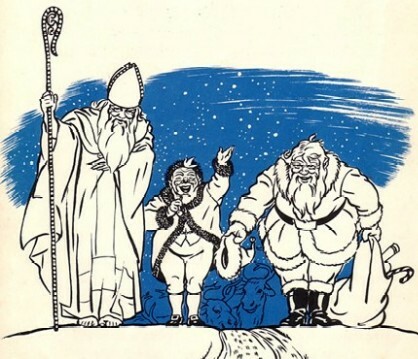 This 1942 illustration shows a traditional European St. Nicholas, Washington Irving's version from Knickerbocker Tales, and the twentieth-century American concept of Santa Claus. From Santa Claus Comes to America (Caroline Singer and Cyrus Baldridge). Nineteenth-century artists such as Felix Darley drew upon this image to create the short, fat Santa. Thomas Nast, in particular, influenced later artists, such as Norman Rockwell, who illustrated commercial publications such as the Saturday Evening Post with similar-looking Santas. The Coca-Cola company may have played some role in establishing the modern Santa; the soft-drink giant began using the character in advertisements in the 1930s. After all, he wears their corporate colours. 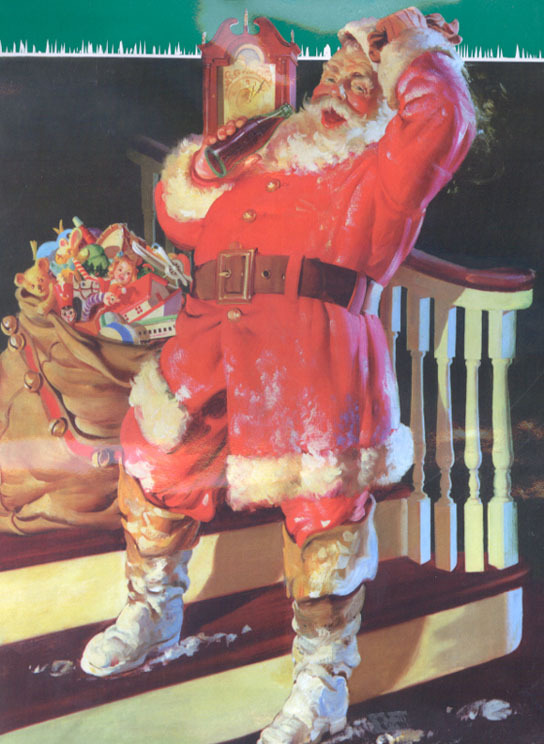 That said, their Santa (painted by Haddon Sundblom) makes few changes to the Nast/Rockwell version, and Coke overplays their connection to the Jolly Old Pitchman. Rockwell's Santa follows Nast's and appears before Coke's. Coca-Cola, for all their claims, made few changes to this version. Saturday Evening Post cover, Dec. 4, 1920. Compare this with the image below. Literature and commerce have brought further touches. In the 1940s, a Montgomery Ward promotional campaign created Rudolph the Red-Nosed Reindeer, while author Valentine Davies further popularized the name Kris Kringle in Miracle on 34th Street. Other ideas have proved less successful. L Frank Baum, of Wizard of Oz fame, wrote a story which gave Claus a lion for a sidekick. For some reason, the notion of a friendly Christmas carnivore has never caught on. Likewise, Baum's names for the reindeer-- Gnossie and Flossie, Racer and Pacer, Reckless and Speckless, Fearless and Peerless, Ready and Steady-- have never grabbed the popular imagination. Santa's changing nature has always reflected popular ideology. He was a fertility symbol when we were closer to nature, a bishop once Christianity became widespread, a commercial pitchman when our culture began bowing to business and finance. Currently, the mass media influences our perceptions of him. Like all good mythic figures, Claus will likely live on; what shape he wears in this millennium will depend on what gods we choose to revere. (an earlier version of this article originally appeared in Scene Magazine, Dec. 17, 1998. Copyright 1998, 2002, J.D. DeLuzio. All rights Reserved. Do not reproduce without permission from the author). 1. Norse dieties may have also influenced Santa's image. Some sources cite both the white-bearded, fatherly Odin and the (often) red-cloaked Thor as cultural ancestors, and connected these to the "King Winter" toasted by some ancients. Of course, many European cultures boast characters who played and play some role in Midwinter celebrations. Italian children, for example, traditionally receive presents from either the Mother-Goose-like Bufana or (as in Spain and elsewhere) the Magi. The American Santa Claus, however, has been steadily driving these regional figures into retreat. The Yule King's general appearance links him to various pagan deities and the modern Claus. 2. Washington Irving developed or popularized many of these American notions of Santa in a pseudonymous work published in 1808. His inspiration is the Dutch version but, significantly, he removes "Black Peter," the figure who accompanies Sinterklas and punishes the naughty children. 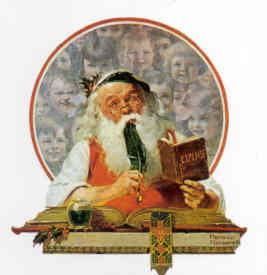 Santa Claus as Haddon Sundblom painted him for Coca-ColaTM. 1. 1. Norse dieties also influenced Santa's image. Some sources cite both the white-bearded, fatherly Odin and the (often) red-cloaked Thor as cultural ancestors, and connected these to the "King Winter" toasted by some ancients. Of course, many European cultures boast characters who played and play some role in Midwinter celebrations. Italian children, for example, traditionally receive presents from either the Mother-Goose-like Bufana or (as in Spain and elsewhere) the Magi. The American Santa Claus, however, has been steadily driving these regional figures into retreat. 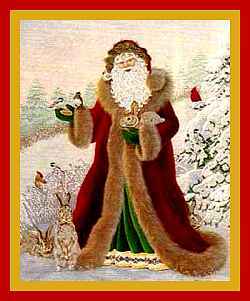 The Yule King's/ Winter King's general appearance links him to various pagan deities and the modern Claus. Always, Carol, ed. Strange Stories, Amazing Facts. Pleasantville, New York: Reader's Digest, 1976. Baum, L. Frank. The Life and Adventures of Santa Claus. Brenner, Robert. Christmas Past: A Collector's Guide to its History and Decorations. West Chester, PA: Schiffer Publishing, 1985. Buday, George. The Story of the Christmas Card. London: Odhams P.
Dawson, W.F. Christmas: Its Origins and Associations (1902). London: Gale Research, 1968. Davies, Valentine. A Miracle on 34th Street. New York, 1947. Golby, John M. and A. William Purdue. The Making of the Modern Christmas. Athens: U of Georgia P, 1986. James, E.O. Seasonal Feasts and Festivals. London: Thames and Hudson, 1961. McKnight, George. St. Nicholas. Williamstown: Corner House, 1974. Moore, Clement Clarke. "A Visit from St. Nicholas." Nast, Thomas. Christmas Drawings for the Human Race (1890). New York: Harper and Rowe, 1971. 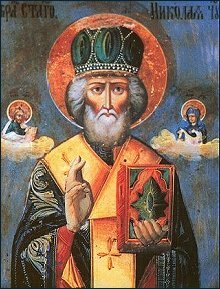 An interesting site with information on the Christian saint, and many images. Various Santa decorations, private collections, London, Ontario. 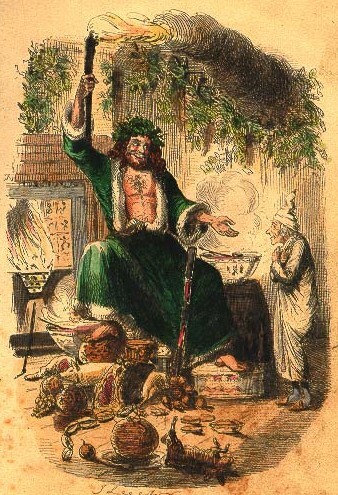 Above: An Old Man Winter/Yule Spirit/Saturn figure presides over the Wassail Bowl at a traditional Yule festival. 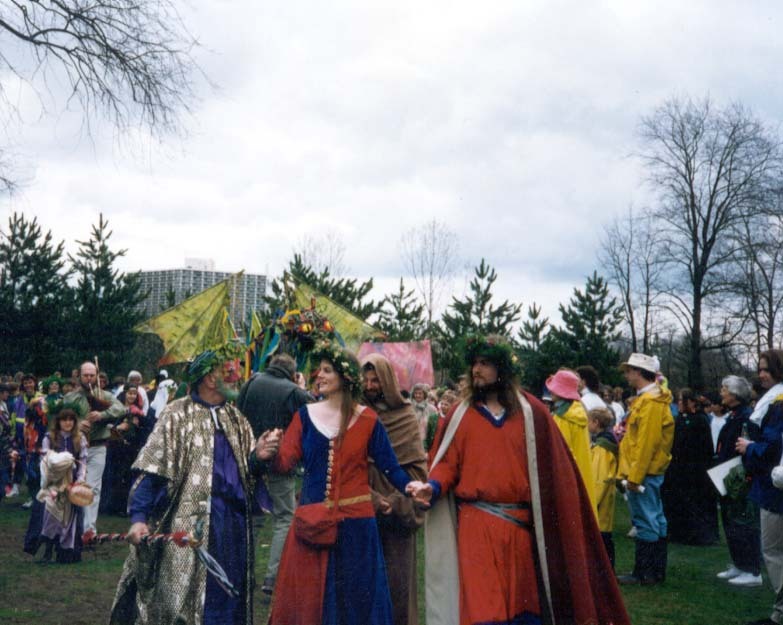 Below:The King and Queen of the May lead the parade at the 1991 Earth Festival in Toronto. 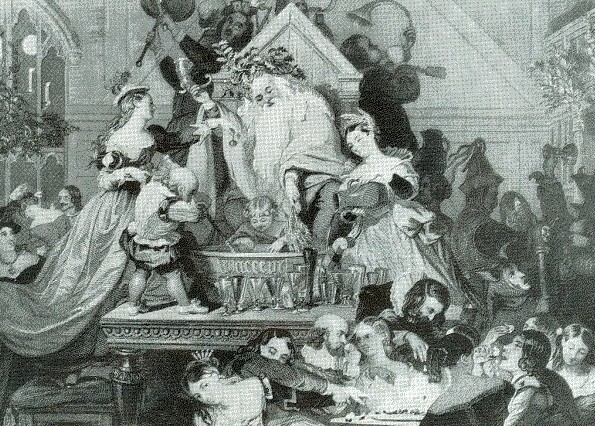 The May King is a relative of Santa's Yuletide ancestors. Photo by J.D. DeLuzio. Do not download or repost without permission.